- CHIKARA Face With A View (December 12, '08) = Frightmare fell to Brodie Lee. - CHIKARA Revelation X (January 25, '09) = Frightmare & Hallowicked defeated The Roughnecks. - CHIKARA If The Airplane Is Snowed In, Put Your Bloody Skis On And Get Going! (February 20, '09) = Frightmare lost to Brodie Lee. - CHIKARA Motive, Means, Opportunity (February 21, '09) = Frightmare was beaten by Ophidian. - CHIKARA King of Trios Tournament '09, Night One (March 27) = Incoherence (Frightmare, Delirious, & Hallowicked) lost in the first round of the King of Trios '09 Tournament to The Masters of a Thousand Holds (Mike Quackenbush, Jorge Rivera, & Johnny Saint). F.I.S.T. (Gran Akuma, Chuck Taylor, & Icarus) won the tournament. - CHIKARA King of Trios Tournament '09, Night Three (March 29) = In a non-tournament match, Incoherence (Frightmare & Hallowicked) competed in a "Tag-Team Gauntlet" Match, which was won by Mike Quackenbush & Jigsaw. - CHIKARA Behind The Eight Ball (April 25, '09) = Incoherence (Frightmare & Hallowicked) fell to 2.0. - CHIKARA The Bobliographon (April 26, '09) = Incoherence (Frightmare, Delirious, & Hallowicked) took down The Roughnecks (Eddie Kingston, Brodie Lee, & Grizzly Redwood). - CHIKARA Aniversario Yin (May 23, '09) = Incoherence (Frightmare & Hallowicked) defeated 2.0. - CHIKARA Aniversario Yang (May 24, '09) = Incoherence (Frightmare & Hallowicked) & Up In Smoke beat Lince Dorado, Helios, Mike Quackenbush, & Jigsaw. - CHIKARA Never Kneel At The Altar Of Conformity (Super No Vacancy) (July 31, '09) = Incoherence (Frightmare & Hallowicked) & Hydra lost to The UnStable (Colin Delaney, Vin Gerard, & STIGMA). - CHIKARA Young Lions Cup VII, Night One (August 14, '09) = Frightmare lost in the quarter-finals of the Young Lions Cup tournament to Brendan Michael Thomas. Player Dos won the tournament. - CHIKARA Young Lions Cup VII, Night Three (August 16, '09) = In a non-tournament match, Frightmare & Turbo were beaten by Mike Quackenbush & Jorge Rivera. - CHIKARA Man Makes Plans, And God Laughs (September 12, '09) = Frightmare defeated Brendan Michael Thomas. 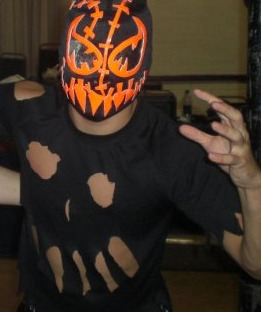 - CHIKARA Hiding In Plain Sight (September 13, '09) = Incoherence (Frightmare & Hallowicked) took down F.I.S.T. (Chuck Taylor & Icarus). - CHIKARA An Optimistic View Of a Pessimistic World (October 17, '09) = Frightmare lost to the CHIKARA Young Lions Cup Champion, Player Dos. - CHIKARA Cibernetico Increible (October 18, '09) = Frightmare competed in the "Torneo Cibernetico" Match, which was won by Carpenter Ant. - CHIKARA Three-Fisted Tales (November 22, '09) = Incoherence (Frightmare & Hallowicked) lost to The Order of the Neo-Solar Temple (UltraMantis Black & Delirious). - CHIKARA The Mint Condition (February 27, '10) = Incoherence (Frightmare & Hallowicked) & The Osirian Portal defeated The Badd Boys & F.I.S.T. (Gran Akuma & Icarus). - CHIKARA A World Of Comforting Illusions (February 28, '10) = Incoherence (Frightmare & Hallowicked) beat The BDK (Sara Del Ray & Daizee Haze). - CHIKARA Wit, Verve, And A Bit o' Nerve (March 20, '10) = Incoherence (Frightmare & Hallowicked), Mike Quackenbush, & Jigsaw took down F.I.S.T. (Gran Akuma & Icarus) & The Order of the Neo-Solar Temple (UltraMantis Black & Crossbones). - CHIKARA Dead Men Don't Laugh (March 21, '10) = Incoherence (Frightmare & Hallowicked) & Mike Quackenbush lost to The BDK (Tursas & Swiss Money Holding). - CHIKARA King of Trios '10, Night One (April 23) = Team Frightning (Incoherence [Frightmare & Hallowicked] & Mike Quackenbush) lost to Team Big Japan Wrestling (Kankuro Hoshino, Yuji Okabayashi, & Daisuke Sekimoto) in the opening round of the King of Trios '10 Tournament. The BDK (Tursas & Swiss Money Holding) won the tournament. - CHIKARA King of Trios '10, Night Two (April 24) = Frightmare lost a "Rey de Voladores Eliminator" Match to Ophidian. Cheech Hernandez and Rich Swann were the other participants. - CHIKARA King of Trios '10, Night Three (April 25) = In a non-tournament match, Incoherence (Frightmare & Hallowicked) won a "Tag-Team Gauntlet" Match. - CHIKARA Aniversario Zehn (May 22, '10) = Incoherence (Frightmare & Hallowicked), Mike Quackenbush, & Jigsaw defeated F.I.S.T. (Gran Akuma & Chuck Taylor) & The UnStable (Colin Delaney & Vin Gerard). - CHIKARA Aniversario Elf (May 23, '10) = Incoherence (Frightmare & Hallowicked) lost a "Three Falls" Match to the CHIKARA Campeonatos de Parejas Champions, Swiss Money Holding. - CHIKARA We Must Eat Michigan's Brains (June 26, '10) = Frightmare lost to the Young Lions Cup Champion, Tim Donst. - CHIKARA Faded Scars And Lines (June 27, '10) = Frightmare & Mike Quackenbush fell to The BDK (Lince Dorado & Pink Ant). - CHIKARA Chikarasaurus Rex: King Of Show (July 25, '10) = Frightmare & The Colony (Fire Ant, Green Ant, & Soldier Ant) were beaten by The BDK (Tim Donst, Lince Dorado, Pink Ant, & Tursas). - CHIKARA Young Lions Cup VIII, Night One (August 27, '10) = Frightmare beat Brendan Michael Thomas, then won an "Elimination" Match over Christian Abel, Amasis, Johnny Gargano, Kaio, and Akira Tozawa in the first two rounds of the Young Lions Cup Tournament. - CHIKARA Young Lions Cup VIII, Night Three (August 29, '10) = Frightmare won the Young Lions Cup Championship, winning in the finals of the tournament over Lince Dorado. - CHIKARA Eye To Eye (September 18, '10) = Incoherence (Frightmare & Hallowicked) lost a "Tag-Team Elimination" Match to The Osirian Portal. The Batiri (Kodama & Obariyon) and The UnStable (Vin Gerard & STIGMA). - CHIKARA Through Savage Progress Cuts The Jungle Line (September 19, '10) = Frightmare retained the Young Lions Cup, beating Pink Ant. - CHIKARA The Dark Cibernetico (October 23, '10) = Frightmare kept the Young Lions cup, defeating Johnny Gargano. - CHIKARA Terror In The Neighborhood (October 24, '10) = Incoherence (Frightmare & Hallowicked) defeated F.I.S.T. (Johnny Gargano & Icarus). - CHIKARA Scornucopia (November 20, '10) = Frightmare stayed the Young Lions Cup Champion, winning over Lince Dorado. - CHIKARA The Germans (November 21, '10) = Frightmare defended the Young Lions Cup, beating Johnny Gargano. - CHIKARA Chaos In The Sea Of Lost Souls (January 23, '11) = Incoherence (Frightmare & Hallowicked) lost to The Batiri (Kodama & Obariyon). - CHIKARA Caught In A Cauldron Of Hate (February 19, '11) = Frightmare retained the Young Lions Cup, taking down Rich Swann. - CHIKARA Clutch Of Doom (February 20, '11) = Incoherence (Frightmare & Hallowicked) & UltraMantis Black were beaten by The Batiri (Kobald, Kodama, & Obariyon). - CHIKARA Operation Big Freeze (March 12, '11) = Incoherence (Frightmare & Hallowicked) & Mike Quackenbush defeated The BDK (Claudio Castagnoli, Sara Del Ray, & Tim Donst). 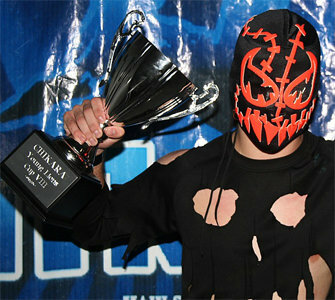 - CHIKARA Creatures From The Tar Swamp (March 13, '11) = Frightmare stayed the Young Lions Cup Champ, defeating Obariyon. - CHIKARA King of Trios '11, Night One (April 15) = The Special Envoy (Incoherence [Frightmare & Hallowicked] & UltraMantis Black) lost to Team Dragon Gate (Super Shisa, Akira Tozawa, & KAGETORA) in the opening round of the King of Trios '11 Tournament. The Colony (Fire Ant, Green Ant, & Soldier Ant) won the tournament. - CHIKARA King of Trios '11, Night Two (April 16) = Frightmare lost a "Rey de Voladores Eliminator" Match to The 1-2-3 Kid. The Amazing Red and Obariyon were the other participants. - CHIKARA Engulfed In A Fever Of Spite (May 14, '11) = Frightmare & Mike Quackenbush fell to F.I.S.T. (Johnny Gargano & Icarus). - CHIKARA Aniversario & His Amazing Friends (May 21, '11) = Frightmare was beaten by Archibald Peck. - CHIKARA Aniversario: The Legendary Super Powers Show (May 22, '11) = The Spectral Envoy (Incoherence [Frightmare & Hallowicked] & UltraMantis Black) fell to Sinn Bodhi & The Batiri (Kodama & Obariyon). - CHIKARA The Case Of The Bulletproof Waldo (June 24, '11) = Frightmare took down Hieracon. - CHIKARA A Demon In His Pocket (June 25, '11) = The Spectral Envoy (Incoherence [Frightmare & Hallowicked]) were beaten by F.I.S.T. (Johnny Gargano & Chuck Taylor). - CHIKARA The Evil That Lies Within, Part 4 (June 26, '11) = Frightmare kept the Young Lions Cup, winning over Kodama. - CHIKARA Chikarasaurus Rex: King Of Sequel - Night Two (July 31, '11) = The Spectral Envoy (Incoherence [Frightmare & Hallowicked] & UltraMantis Black) took down El Generico & 3.0. - CHIKARA Martyr Yourself To Caution (September 18, '11) = The Spectral Envoy (Frightmare, Hallowicked, UltraMantis Black, & Crossbones) beat Sinn Bodhi & The Batiri (Kobald, Kodama, & Obariyon).